This is a recipe that we stumbled upon during Meatless May, and one that we’ve made over and over ever since. Before 2009, I wasn’t so sure that I liked brussel sprouts. We never ate them growing up, and so when I was young and heard people making jokes about brussel sprouts and how terrible they were, I never knew what they were talking about. Then when I figured it out (much later) I didn’t want to buy them because all I’d heard was that they were gross. And they are gross, if you overcook them. But if you don’t overcook them, they are ridiculously good. 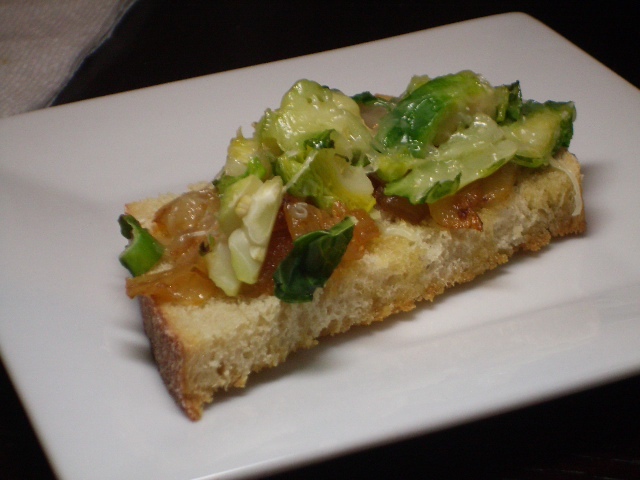 We’ve made all sorts of brussel sprouts – but have never posted a recipe here. They often show up in the background of other posts…but have never been featured. We’ll have to fix that. For now, this new take on brussel sprouts will have to do.